Edmunds & Co., Salt glazed stoneware jugs and jar with cobalt slip-tailed decoration. 14 x 8 in. (jugs), 13 x 8 in. (jar). Photo by Joseph Szalay. Stuff. My mother is gone, my father before her, and what we are left with is stuff. Lots of stuff. And it all must be dealt with. Material things, philosophers and religious leaders tell us, are of lesser importance than the immaterial. “Do not lay up for yourselves treasures on earth,” Matthew urged his early Christian followers. “It is preoccupation with possessions, more than anything else, that prevents us from living freely and nobly,” Thoreau wrote. Who would disagree? Yes, of course, love and happiness and character are what matter. “You can’t take it with you,” is oft repeated in conversation when referring to other people’s acquisitions. And yet, the majority of us leave behind a raft of stuff, most of it quite ordinary. It’s hard work to decide what to dispose of, what to keep, and who keeps what. My siblings and I have made spreadsheets. We have sent e-mails and texts to one another. We’ve walked from room to room taking notes. It’s a small house, 1,300 square feet, but the task still seems overwhelming. Of course, what I choose for myself is pottery: four jugs, a jar, and a small tureen, all nineteenth-century. Two of the jugs are small, one squat, with broad shoulders, in excellent condition; the other taller, narrow, swelling ever so slightly from the base, with a look-at-me, hands-on-the-hips jaunty handle. Both are glazed in an Albany Slip–type glaze, so favored by early American potters. 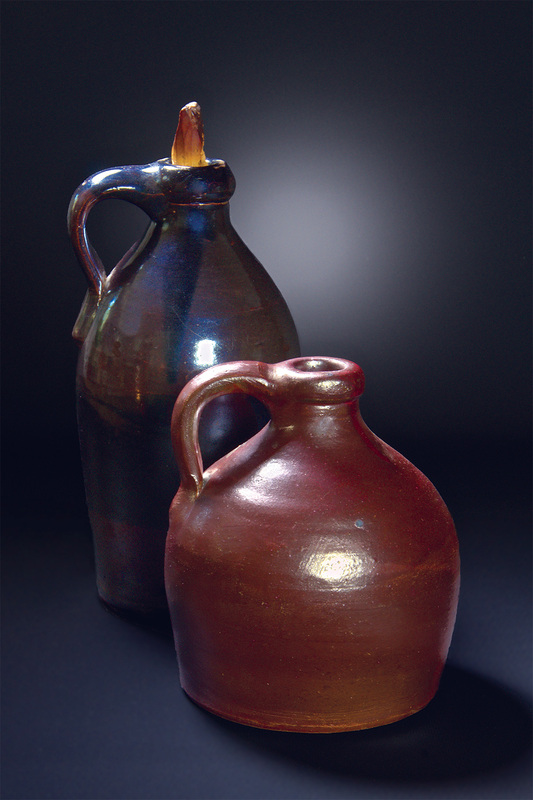 The taller jug is dark and glossy, almost black, likely fired in a hot spot near the flame. The squat one is a rich brown. I also brought home two two-gallon jugs and a two-gallon jar. All three were salt-glazed and decorated with rich blue cobalt slip-trailed floral designs. Lastly, there is the small sauce tureen with ladle from my mother’s fairly large collection of flow-blue china. The smaller jugs are in my kitchen now, on a shelf, visible from almost everywhere in the room. I placed them so that I can easily pick them up, run my hand over the glazes, feel the curves, understand the potter’s moves. I hold the taller, glossy one and remind myself that by the time it came into my mother’s possession, it had already outlasted at least several owners. The two salt-glazed jugs now sit prettily in my living room, on the floor in front of bookshelves. I set the salt-glazed jar on top of the kitchen cabinets next to a Bartram pot from Guy Wolff. In my parents’ house, the small jugs sat at opposite ends of the large fireplace mantel. The taller one has a crude handmade wooden stopper that has deteriorated. I do not know if the stopper is original to the jug, or if it was made later as a replacement. A spray of bayberries or bittersweet always graced the shorter jug. My mother’s dream was to live in an old house in Connecticut. Instead, she remained in the 1957 tract house, originally a 900-square-foot ranch identical to thousands of others built the same time, until her death a year ago. But inside that house, she and my father re-created the look of an old house by installing hand-hewn ceiling beams, a large open fireplace at which our dad cooked food in iron pots on holidays, wide-board paneling, and cupboard doors made from old barnwood. The eldest of five children, I had already moved out when they did this remodeling, but I came back for family gatherings. My parents began purchasing antiques for the house in a small way in the sixties, and more in the seventies and eighties. For my parents antiques were objects of beauty, something to surround themselves with (though they did use their iron cookware). For the various antique dealers they dealt with, the pieces were inventory. But at some point before being offered for sale in the antique shops where my parents liked to browse, the jugs, jar, and tureen were in other households, bought perhaps from earlier antique dealers or passed down by family members. The earlier twentieth-century owners might have displayed them as decorations or perhaps stashed them in an attic or barn as no longer useful. I like the jugs and jar because they are well thrown, because they are beautiful, because jugs and jars are two of my favorite shapes, and because I am a potter steeped in pottery history. I like them because they belonged to my parents. When I see these pieces, I think of the room with its brick walls and enormous fireplace. I think of the family gathered around the table. I think of my mother’s love of houses and early Americana. These objects that have outlasted my parents give a lingering suggestion of who they were. This is what families do: We cherish the things our parents or grandparents leave to us, we attach meaning to these things. Yet the memories and feelings that earlier owners attached to the very same objects have vanished. Nothing remains of the place theses pots held in the previous owners’ psyches. The pots, inanimate objects, are unchanged throughout the centuries; it is the meanings we impose that change. I know that the earliest owners would have used all these pieces in the preparation, storage, and serving of food. These were utilitarian pots. The jar might have held apple butter, pickles, eggs layered in salt, butter, or maybe soft soap. The jugs would have held cider or vinegar, water, perhaps homemade wine. The two-gallon jugs would have been heavy when full, and used for long-term storage. The smaller ones would have been refilled from larger jugs for more immediate use. Fortunately, the pots do yield information about their manufacture. Except for the flow-blue sauce tureen, they were all thrown on a potter’s wheel, wood-fired, and American made. The salt-glazed jar and one of the jugs are stamped with the name Edmands & Co., so I know it was made in the shop of Barnabas Edmands. Edmands opened his business in 1812 in Charlestown, Massachusetts (an early pottery town and now the part of Boston where the Bunker Hill Monument stands). Here he introduced stoneware made from clay shipped from New Jersey. He promoted it as being safer than the lead-glazed redware previously made by the numerous potters in this area. Edmands came from the brass trade and was not a trained potter. He relied on the expertise of Frederick Carpenter, a highly skilled potter from Lebanon, Connecticut, who served as the master potter from the shop’s opening days until his death in 1827 at the age of 56. After Carpenter’s death, Charles Collier, a potter and inventor, became the master potter. Though a small operation, with at most five men working in the pottery, Edmands & Company entered “a very large stone jug at the second annual fair of the Massachusetts Charitable Mechanics Association” in 1839 and won awards. (Watkins, 84) When Edmands retired at the age of 72 in 1850, he sold the pottery to his sons, who ran it in partnership with Charles Collier. At this time, they also purchased jugs “by the dozen” from the Norwich, Connecticut, potter Sidney Risely. In 1868 the name changed to Powers & Edmands and still later changed to Edmands & Hooper. So, from the stamped name across the fronts of two of my mother’s pots, I know that they were made sometime between 1812 and 1868 but most likely around 1860. 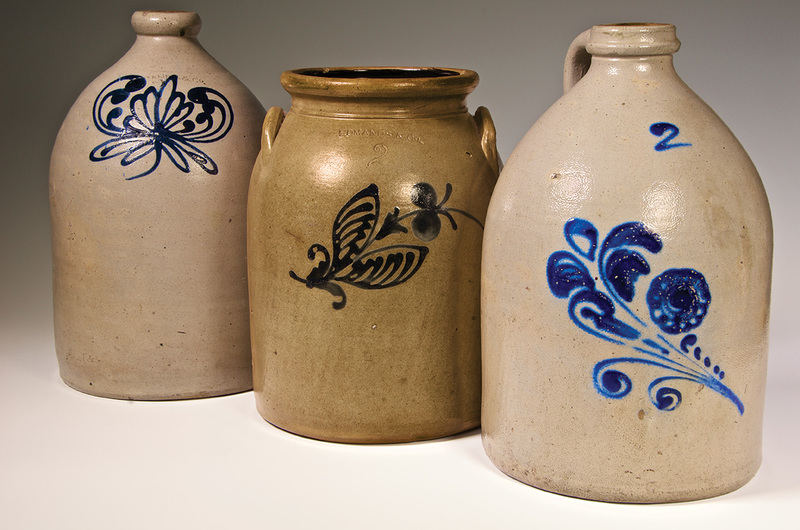 The two smaller Albany slip–type jugs are not stamped or signed, and there is no decoration, so it is difficult to know where they were created. True Albany Slip, made from glacial clay dug near Albany, New York, was widely used in New York and Pennsylvania in the nineteenth century. By the end of the nineteenth century and most of the twentieth century, the slip clay was mined and shipped to potters all over the United States. At the same time, potters dug and used similar local clays as slip glazes. I have no way of knowing whether it was true Albany or a similar locally dug clay. On the jugs, you can see the marks of the potters’ hands. When the potter attached the handle on the taller glossy jug, he pressed the clay with his thumbs, harder with his right than his left, making the tail of the handle slightly longer on the left side. I often do this, too! I smile to myself at the similarity. The potter who made the shorter jug was more fastidious about his handle and smoothed it evenly as he attached it. Still, I like the lilt of the first handle better. My mother loved flow-blue china. Over the years she added many pieces to her collection: plates of various sizes, a platter, cups, and eggcups. She kept the collection in a particularly beautiful, antique, oak china cupboard with two small-paned glass doors above three drawers. I brought the sauce tureen home and set it next to the Royal Albert bone china teacup with hand-painted daffodils from my grandmother’s teacup collection. I like having a single piece from each of their collections next to each other. 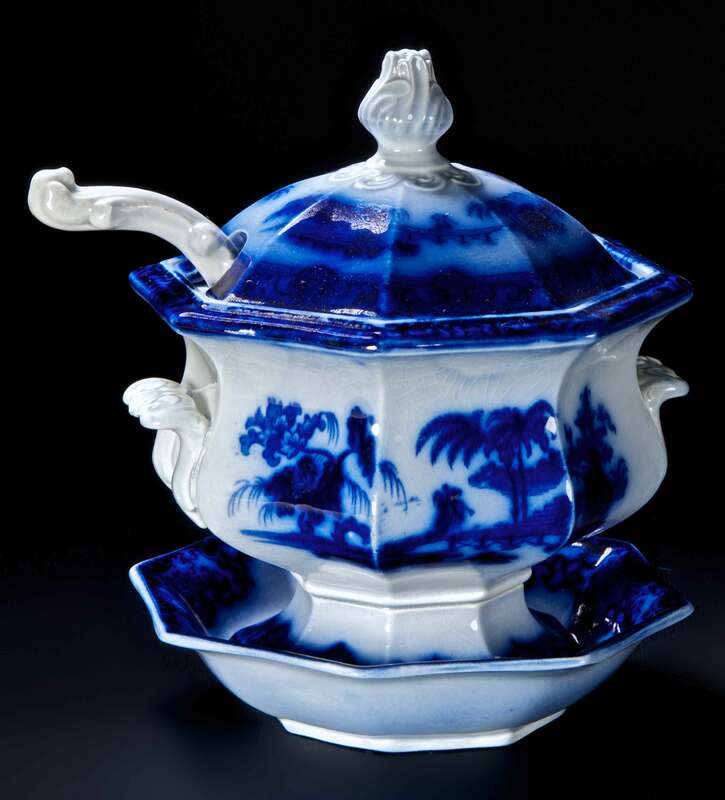 The tureen is decorated in the Manilla pattern, featuring willows and palm trees and a sailing ship in a very dark cobalt blue with heavy bleeding. It was made in the bustling potting town of Staffordshire, England, by Podemore & Walker sometime between 1845, when the Manilla pattern was first introduced, and 1860, when the firm became Wedgwood & Company. Created by accident when artisans attempted to copy Chinese hand-painted blue-and-white porcelain, the bleeding edges of the cobalt transfer images, while considered a flaw by the company, appealed to the public. It was far less expensive than Chinese porcelain. British factory potteries produced quantities of flow-blue for the American market. Though it was called porcelain, it was earthenware. Podemore & Walker formulated a clay body that could be fired to a higher-than-usual earthenware temperature, making it more durable than other earthenware. Dealers today refer to Podemore & Walker flow-blue as ironstone. 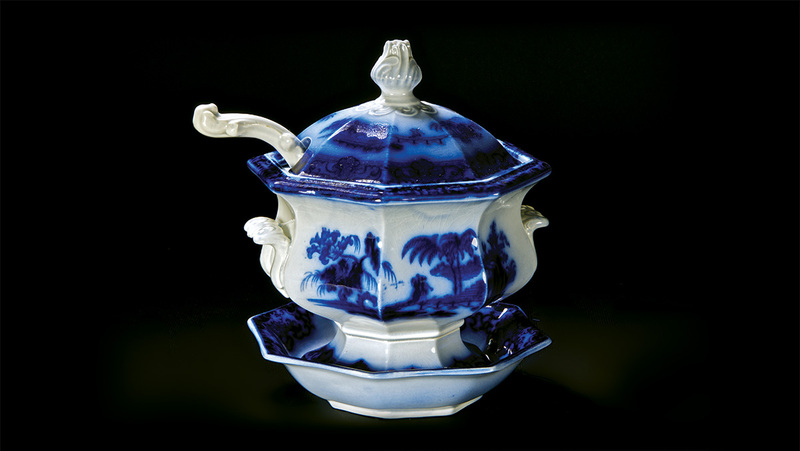 Flow-blue china, factory-made and imported from England, was more highly valued by homemakers of mid-nineteenth century America than hand-thrown, locally made stoneware. Many households could not afford this fancy tableware. Those that could displayed it prominently and used it for special occasions. Very popular, it was produced and exported in large quantities and, in time, became more affordable. By the mid-twentieth century, it had become collectable. I am more drawn to the folk-pottery style of the thrown jugs and jar, but I enjoy the fact that together, the jugs and the tureen give a snapshot of the Industrial Revolution, which radically changed how people lived and how they perceived the objects of everyday life. Unlike the serving pieces of earlier times, this tureen was made in a factory where there was a separation of tasks, where whole families worked long hours, where there was extraordinary technical innovation and scientific research taking place even as the smoke from this new system of production polluted the skies for miles around. The tureen’s form was influenced by Chinese wares that British potters did not know how to replicate. And the object itself traveled thousands of miles across the Atlantic in a sailing ship before ending up in someone’s parlor. The other pieces, masterfully made using traditional methods, represent the end of an era in ceramics history. With the advent of railroads and refrigeration, and the rise of cities and factories, there was no longer a need for the crocks and jars and jugs that potteries such as Edmands produced. To survive, they turned to drainage pipes and used jiggers and jollies. The old skills were lost. Kilns fell into disrepair and ruin. Small potteries closed. There is a seventh pot that I have brought home, a blue colander my mother made. It is somewhat painful to look at, but it was her favorite pot, and she kept it by the sink. We took our first pottery lessons together from a woman who taught in her home studio, and then we attended Wesleyan Potters for a while. I was smitten. I thought she was, too. She bought a Shimpo wheel and set it up in the basement. She fired a few things, including the colander, in the hard brick kiln I built. But then, inexplicably, she stopped. She hated the cellar. She had bursitis. She had too much to do. The reasons were numerous. I worried, I still worry, that somehow my own obsession led her to let go of it. I felt guilty but could not understand why I felt guilty. Looking at her things now, I realize how many crafts she took an interest in and began – rug-braiding, needlepoint, cross-stitch, candle-making, doll-making, stenciling – a compendium of early American activities. And she could draw. But mysteriously, she did not follow any of these pursuits for long, though she appeared ever ready to resume with supplies and books about them at hand. She kept the few pots that she made on display in the living room and kitchen the rest of her life. My mother lived for eighty-eight years, and then she was gone. The six pieces of pottery have already been around twice as long. They will last for many more years, perhaps thousands. I think a lot about ceramics, objects, material culture, but I still do not understand what it means that our possessions outlast us. I know only that they do. Perhaps that is why we are so outraged when ISIS destroys ancient temples and artifacts. With this destruction, we lose our connection to people who have gone before us. The only way we can know of them is through what they left behind. Ceramics, notable for longevity, have always been crucial to understanding history and how people before us lived. Needless to say, my mother left behind far more things than the pots I claimed. We thought our mother had left a letter detailing what to do with her things, and we searched the house together, drawer by drawer to find it, but without success. Still we made progress: we itemized the contents of the house and decided who would take what. Then my younger sister, and the one nearest to me in age, unexpectedly grew ill and died, leaving her possessions behind. I think, then, what to do about what I will leave behind? First, I must make a list so that anyone who must deal with my things will know what they are and how they came to be here. I will write down why the flow-blue sauce tureen next to the daffodil cup, both so unlike any other ceramics in the house, was important to me. I will try to make suggestions for dispersal, though you can never really know what others will want and what will be a burden. And, inspired by my sister’s shells, I will leave gifts. Maybe I’ll throw a quantity of tea bowls and pack them away for that, I hope, very far off day. Author’s Note: Two books that I have referred to often throughout my potting life and that were helpful in researching my mother’s pots are American Stonewares: The Art and Craft of Utilitarian Potters by Georgeanna H. Gree and Early New England Potters and Their Wares by Lura Woodside Watkins. Editor's Note: This essay was originally published on Suzanne’s blog, BiblioPotter, on September 3, 2015, and is reprinted by Studio Potter with the author's permission. Suzanne Staubach is a potter and writer. Her books include Guy Wolff: Master Potter in the Garden and Clay:The History and Evolution of Humankind’s Relationship with Earth’s Most Primal Element, both from University Press of New England (UPNE). She writes and pots in Ashford, Connecticut.